The location, a gully on Cot Valley beach in Cornwall, was chosen by photographer Bjorn Thomassen for its spectacular rock formations and gigantic mega-pebbles. 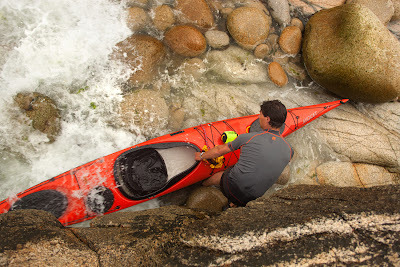 Less so for its for ease of access while manhandling composite sea kayaks, as there is no path into the gully, but we are no strangers to adversity. As well as the four of us in the photo, there was just Bjorn, assisted for the day by awesome Swedish photographer Jeanette Svensson. But as always everyone just mucked in and lifted and carried stuff. And there was a lot of stuff. Portable studio lights from Elinchrom and The Flash Centre. That's three Elinchrom Quadras with their diffusers and stands, plus two giant folding California Sunbounce reflectors, battery packs, cameras, spares, stuff to keep it dry... 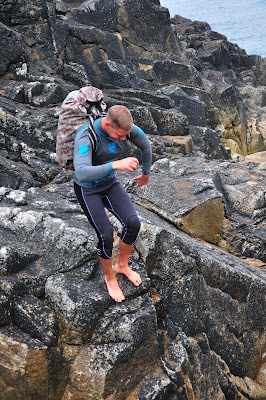 Frankly it wouldn't have been possible to get the job done in the tide/weather window of about six hours without the super-portable power packs and lighting equipment, unless we'd had a separate rigging team. The Kayaking Manual has been on the streets for over a month now, and bandied around the various social media for longer than that. That photo is, so far, the only image that I've received significant grief over. Some paddlers felt that the models looked too tanned, warm and happy, and that this didn't reflect their idea of kayaking. And a couple of people thought it was a bad thing that they look like models. Sorry... The thing is, all four of the people in the shot actually are models. 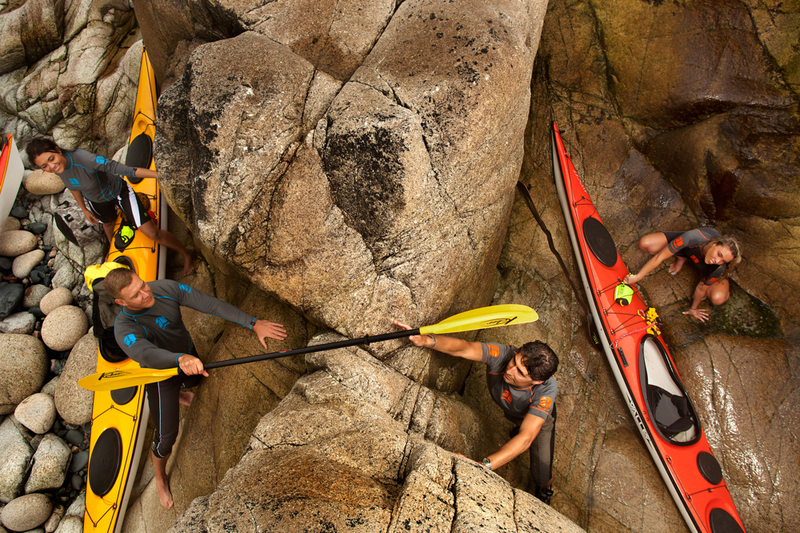 The fact that three of them also happen to be kayakers is kind of by the by. They were selected for the fact that they look outdoorsy and sporty, but more importantly that they can stand stand around all day getting windblown, wet, cold and hungry and still be able to smile and look good! "...none of my friends and I go on a trip with coordinated tops and shorts." 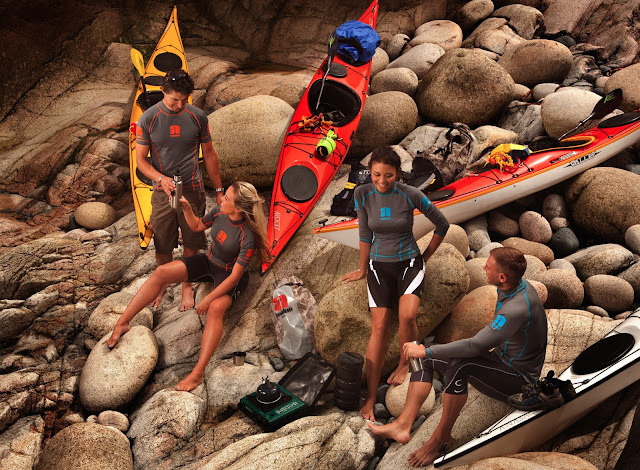 Of course, part of the mission was to feature the boats from Valley Sea Kayaks and the neoprene and thermals from Nookie. I can't get all the photos for a book like this without the help of sponsors. That's why everyone's wearing matching gear - it all comes from the same manufacturer, and the sub-plot here was to get them some catalogue shots in return for the equipment. The paddles are all from the German manufacturer Kober. The boats, while all Valley, have a bit more variety, but I still don't understand the criticism that they're "too shiny". My boats get dusty and muddy in the back garden, but they tend to get very clean in the water. What these pics really show is the massive difference between photos of how the location really looked (mine) and the ones Bjorn lit carefully with the Elinchrom gear and shot on the top cameras and lenses from Canon. It's like pumping a little magic into the shot. And that's what I wanted... I do understand the criticisms of those who'd prefer to see grittier pics, perhaps of unhealthy looking people being cold and miserable, but I don't think that's going to sell as many books! That's it until the next instalment. Have fun, and don't forget to breathe. Models look on as Bjorn positions lights and kayaks. Look at the difference in light and texture in the next photo! Another of Bjorn's shots from the same set that was used in the back inside cover spread of the book. I love all the different compositional elements of this photo, it's more of an art shot than a lifestyle one.